A repair order template is something that most businesses use in order to simplify the process of getting something repaired whenever a problem is detected. A repair order template can vary from a very simple straightforward form to one that goes more in depth in order to provide additional information. The type of template that is used is often reflective of two things, including the location where the template was downloaded and the amount of information that needs to be provided for each situation. The best thing about downloading a template of this type from this page is that it can be downloaded right away and there is absolutely no charge to you for its use. Furthermore, the template is very easy to use. You can customize the template to fit your needs, allowing you to download one template that can be changed as needed for different situations. This means that you spend a minimum amount of time looking for the right template. Use of the template is very easy. It was designed for ease of use and as such, the entire process is very straightforward. After you have downloaded it you can then customize it to fit your particular needs and save both the original version and the customized version. You can then print it out so that your staff members are able to fill it out as needed. The repair order template is designed specifically to allow staff members to know exactly what is needed when there is a problem with a certain piece of equipment. This particular template does exactly that with a minimum amount of effort on your part. 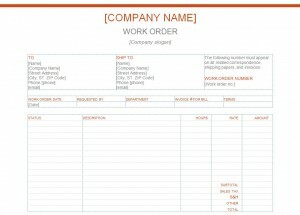 It also allows you to download and customize a template quickly so that you can print it out and focus on other aspects of operating your business. It also ensures that your equipment will be repaired in a timely fashion and that damaged equipment will not be used until it has been adequately repaired. This in turn increases the level of safety and efficiency with which your business can operate.